Does it matter that only 7% of British films make a profit? Just 7% of films made in the UK turn a profit, according to figures revealed by the BFI last week. The statistics relate to more than 600 British films released in cinemas between 2003-2010. They showed lower budget films - such as those made for less than £2m - were less likely to make a profit (4%). The figure improves as budgets rise - with 17% of films that cost more than £10m making their money back. But British film director Paul Greengrass says the figures do not not tell the whole story. Speaking at the British Independent Film Awards (Bifa), he described the British film industry as a "success story" and predicted it would continue to see international growth - especially in China. A BFI spokesperson said the 7% figure included "tiny budget films that, while commercial success is always hoped for, are successful and beneficial to the industry for other reasons like skills and training development and for artistic and cultural importance". Greengrass told the BBC on Sunday night the 17% figure for higher budget films was approximately the same rate of profitability as Hollywood. "I'm not saying it can't be improved, but it's always been the case," he said. "In the heart of Hollywood, it's the big movies - the big franchise movies - that pay for all the rest of the productions. "No film industry in the world works on the basis that 100% of the movies are going to make money." He went on: "This is a success story. With success comes choices and a need to continue to build growth and sustainability. "We're nowhere near where we were in the '80s when we were trapped in low budget British film-making, with films that no-one wanted to go and see." Greengrass, whose most recent film is the US-backed Somali piracy thriller Captain Phillips, said he hoped more could be done to get British films in cinemas, with more promotion on TV and internationally. He was also positive about a China-UK co-production treaty, which he predicted would open up a huge new audience for British films. "This is a big industry," he said. "It's right up as one of the leading industries in this country in terms of revenue creation, and job creation and growth and opportunity." Also at the Bifa awards, best actor winner James McAvoy said he was "really proud" that Filth, which he co-produced, had managed to make £4m at the box office - more than twice its budget. "An independent film managed to get people to come and see it without a studio and without hundreds of millions of dollars of advertising money. That's remarkable - it means British film can do it on its own." He said $100m (£61m) movies that "sometimes aren't very good" had an advantage over smaller films because they had a massive budget to sell the film. "Films like Filth can be leagues ahead of the $100m movie, but they've got no money to get a poster in the paper. So who's going to come and see them? "Maybe VOD [video-on-demand] is going to change everything because the distributor and the studio might become less important." In July this year, Ben Wheatley's film A Field in England was the first UK film to be released simultaneously in cinemas, on DVD, on TV and through video-on-demand. Wheatley's "psychedelic trip", set during the English Civil War, took more than £21,000 at the box office on the same weekend it was available free of charge on Film 4. It also sold more then 2,000 copies on DVD over the same period. The film was made on a modest budget of £300,000. Wheatley, whose previous films include Sightseers, Kill List and Down Terrace, said the release model was an appropriate way to maximise audience figures for a film made on such a small budget. John Giwa-Amu, producer of the forthcoming sci-fi thriller The Machine, said VOD was one of the distribution options he was investigating to accompany the film's limited theatrical release on 21 March, 2014. His movie, which was filmed in Wales and stars Toby Stephens as a scientist working on a top secret artificial intelligence project, won the Raindance independent film award on Sunday night. The movie's director, Caradog James, said: "The toughest thing is you make a good film but can you get it to reach an audience? It's events like this and individuals who champion independent cinema that give us a profile and any chance of a mass audience." In order to find investors in the project Giwa-Amu and James pitched their movie idea to "Dragon's Den-style" gatherings of millionaires around the country. Money eventually came in from a Swansea-based backer along with a job creation grant from the Welsh Assembly, while the Film Agency for Wales funded some test footage to showcase the film's special effects. 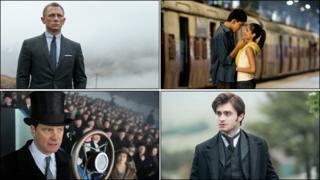 The BFI says the UK's export film industry is the second strongest in the world after Hollywood. Profitability figures, it adds, do not necessarily reflect the whole value chain of a film's life and don't take into account the long tail profit and life of a film which can "continue for decades". It also says the commercial landscape is changing and the VOD market has increased by 50% last year. "I'm very excited by where we are," said Greengrass. "It's an endless debate. You'll find people who say it's a nightmare in the British film industry. I'm not one of those. I think that it's transformed from where it was 25 years ago. "I'm not minimising the problems. There will be producers and directors out there tearing their hair out because of problem of access to production finance or access to distribution. "But what we've got in Britain that is unique on the global stage is a vibrant domestic UK independent production arena which, for all its difficulties, is still making very good films that are internationally acclaimed year after year. "We also have, on the other hand, tremendously vibrant international film-making in the UK. You can't get a sound stage in this country for the movies that want to come in here. "The challenge of the next three to five years is to get those two sections of the film industry to cross-fertilise in ways that generate growth for our film industry."